It can only be a matter of time before we ditch our ice cream makers in favour of dry ice. But in the meantime, this futuristic recipe can be made the old-fashioned way. Pour the whisky into a pan, warm and set alight. Allow the flame to burn out and the whisky to cool. Whisk together the egg yolks and the sugars. Whisk together the skimmed milk powder and milk in a separate bowl, then heat this mixture to 50°C. Whisk some of the hot milk into the sugar and egg yolk, then pour this back into the remainder of the hot milk, whisking everything together. Heat the mixture and hold at 72°C for 15 minutes, stirring constantly. Place a freezer container in an ice bath. Pour the mixture into the container and cool, stirring often. Place the mixture into a mixer with a whisk attachment. Wrap the dry ice pellets in a clean towel and use a rolling pin to smash them into a powder (be sure to wear glasses or goggles while doing this). 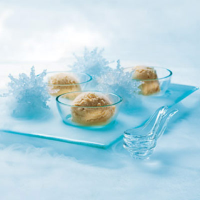 While the mixer is running on slow-to-medium speed, gradually scoop the dry ice into the ice cream, not allowing it to froth over, until the mixture has a thick, ice-cream texture and the dry ice has evaporated. Serve immediately or freeze in a plastic container.